There are three species of zebra: Burchell's or the plains zebra, Grevy's zebra and the mountain zebra. Although each species looks similar, there are differences in appearance. Zebra of all species prefer to live in open grassland, and you'll find them in Eastern Africa, particularly in Kenya, and in parts of southern Africa, especially around the Limpopo and Zambezi rivers. Like horses and asses, zebras belong to the equid family. The main characteristics shared by the group are that they are long-lived, fast movers with large teeth suitable for chewing anything herbivorous. Zebra, regardless of species, live approximately 25 years in the wild and up to 40 in captivity. The zebra looks similar to a horse, except he has a short, tufted mane and those distinctive stripes. Each zebra species has its own general stripe pattern, but more fascinatingly, every zebra has his own unique stripe pattern, in the way that a person has a unique set of fingerprints. Scientists offer a few suggestions about the purpose of a zebra's stripes. They may act as camouflage or like sunscreen, or they may keep flies away or help zebras to recognize each other according to the National Geographic. 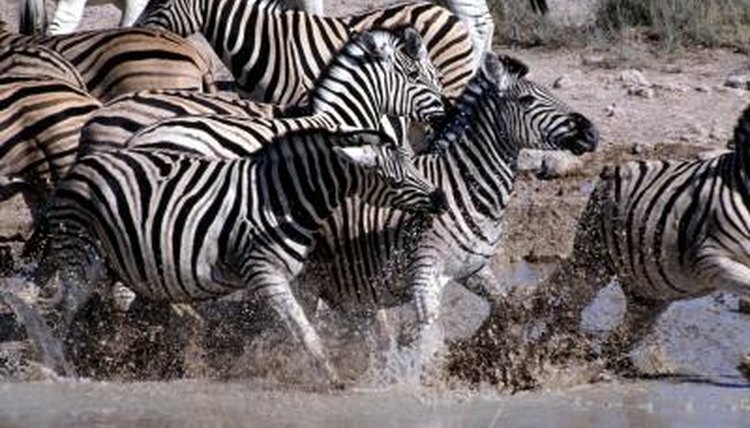 As is typical in the sciences, two species of zebra are named after the scientists who discovered and identified them. Burchell's zebra, which also is referred to as the plains zebra, is the most numerous of the three species. One of the best places to see plains zebra is in the Serengeti park in Tanzania, according to the African Wildlife Foundation. The plains zebra likes to live in smallish units consisting of a stallion, a few mares and their young. These small units occasionally get together with others to form spectacularly enormous herds. These herds usually are the first to enter new grazing pastures, particularly wetlands. They trample down the long vegetation so the gazelle and wildebeest can follow. Grevy's zebra is larger than Burchell's, weighing between 770 and 990 pounds compared to 485 to 550 pounds for a Burchell's zebra. Two features distinguish it from the other zebra species: it has a longer mane and larger ears. The Grevy is only about 5 inches taller than Burchell's zebra, which indicates that Burchell's zebra has a much stockier body. Perhaps that is why the Romans used Grevy's zebra, which they called hippotigris, to pull carts in circuses. Grevy's zebra are found mostly in northern Kenya, but in substantially reduced numbers. There are only around 2,500 Grevy's in Africa compared to 15,000 just a few decades ago, according to the AWF. Converting grazing land to agricultural use is one major threat to these animals. The mountain zebra has two subspecies: Hartmann's and the Cape mountain zebra. These species mostly live in southern Africa, particularly Namibia and western South Africa. Compared to Burchell's and Grevy's zebra, this species prefers mountainous areas. His stripes are thinner and more numerous than those of the Burchell's zebra, and he has broad stripes on his rump that distinguish him from the other two species. He also has a fold of skin on his throat, called a dewlap, that other zebras don't have. Both subspecies are classified as endangered. In the past hunting decimated herds, but land cultivation now is a bigger threat.